Vocals can be included for wedding ceremonies, etc. Quoted price is for performing for about 75 minutes over a 90 minute period. Geraldine McMahon is an unusual and highly talented musician who can both sing and play the harp to the highest professional standard. Singing and playing the piano from an early age she later extended her musical talents by studying the concert harp. She won a scholarship to the Royal College of Music in London where she studied singing for three years, and won an award for a further year’s postgraduate study as well as several other prizes. Since then her career has taken her around the world including several years touring the United States where she appeared on numerous radio and television shows and released her first record album. 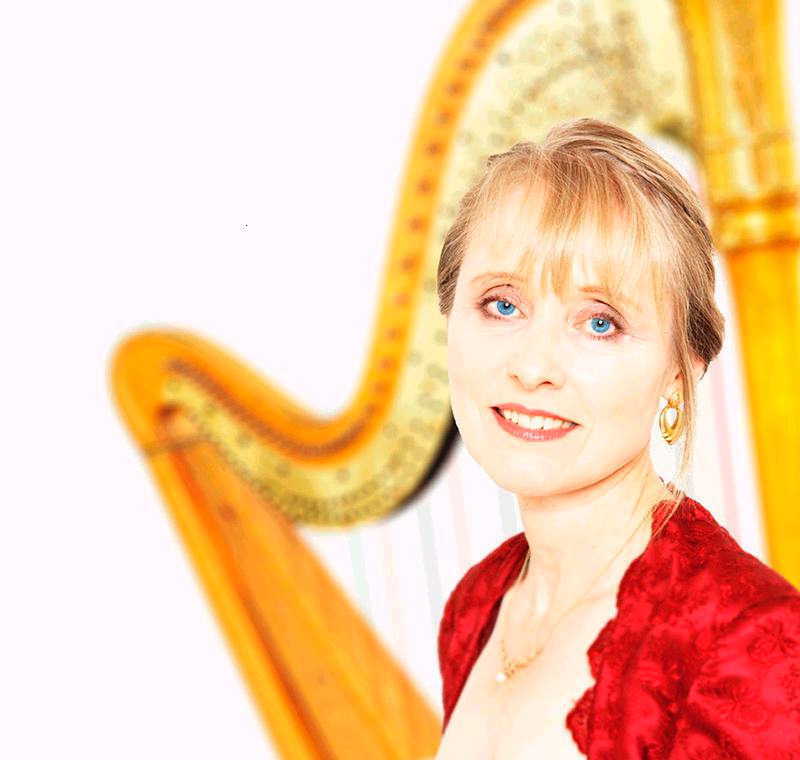 Geraldine was resident soloist, singing with her harp, at the medieval Bunratty Castle in Ireland and has also held residencies in several prestigious London hotels including The Savoy. She regularly plays for a wide variety of functions specialising in weddings and corporate receptions, as well as performing in concerts and cabarets. Geraldine’s extensive repertoire consists of classical, folk music and arrangements of popular songs and show tunes, and she is happy to play the harp on its own, accompany her own singing, or sing with an appropriate accompaniment from, for example, a church organist. At weddings, she can perform both during the ceremony and during the reception if required. Our quoted price is for her playing for about 75 minutes over a 90 minute period. Geraldine McMahon is based in Hertfordshire. See Pricing for details of travel costs, etc. "Geraldine was very much the unsung hero at this event, she contributed in creating a special atmosphere for all our VIP award finalists, adding an air of class and refinement to two very special award dinners." "Geraldine made all our dreams come true by singing as I entered the church. Her harp playing was just magical and all our guests were very touched by her music." "We both want to thank Geraldine for her beautiful music which she played at our wedding ceremony. All our guests commented on her music and said that it really made a very special atmosphere in the castle! Ryan and I both found the music very relaxing and calming and we are so glad that we picked her! I think that my little girl summed it up really well when she told us "That music makes me smile" so thank you very much for being there for us and helping to make our day so special." "Geraldine was brilliant, the service was breathtaking and her music added so much to our event. The staff at Function Junction were incredibly helpful and professional - would recommend to others. Thank you all so much!" "Geraldine was excellent, I'm sorry I didn't have a chance to speak to her on the day, but I had so many compliments about her and the music really was beautiful." "Fantastic! Geraldine was everything we'd hoped for and more. Her playing suited the venue perfectly and we couldn't have asked for a more professional and entertaining musician." "Geraldine was fantastic, she added that something extra, to my wedding day. Many of my guests commented on how much they enjoyed her playing." "Geraldine was fantastic and lovely, as were the friendly staff at Function Junction." "Geraldine was brilliant, the kids were mesmerized by her! We wouldn’t hesitate to recommend both Geraldine and Function Junction. Thank You!" "Geraldine McMahon was perfectly lovely. Her beautiful music literally brought tears to our eyes."